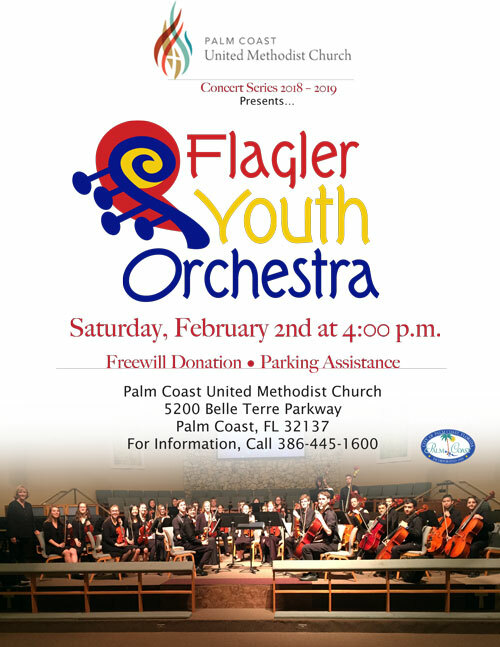 Members of the Flagler Youth Orchestra will perform on Saturday, February 2nd, at 4 p.m. in the Palm Coast United Methodist Church’s Concert Series. Sue Cryan will conduct the Flagler Youth Orchestra’s Harmony Chamber Orchestra with a program featuring music by several composers to be named. The concert will be held in the sanctuary of Palm Coast United Methodist Church at 5200 Belle Terre Parkway. Parking assistance is provided. A freewill donation is encouraged. This concert is made possible in part with a cultural arts grant from the City of Palm Coast. A reception with the members of the orchestra will follow the concert. For more information about the Concert Series, call (386) 445-1600. The Flagler Youth Orchestra is made possible by the Flagler County School District, with the support of the Friends of the Youth Orchestra, whose sole mission is to provide free music education after school to all Flagler children with a desire to play an instrument. For more information on the Flagler Youth Orchestra, contact Cheryl Tristam, program director, at (386) 503-3808 or by email at Cheryl@flagleryouthorchestra.org.